Lois arrives at the Hamilton Horn to talk about writing for the paper, determined to split her time between the Horn and the Planet in her two personas. As the editor, Candice invites her into the office Frankenstein crashes in. Lois tries to step in even using the Hellbat glove she stole from the moon Batcave to fight off the intruder and protect Candice. The two women race outside and steal the S.H.A.D.E. vehicle with Frankenstein in pursuit. Superman intervenes and the two metas go toe to toe in a field. With the aid of a tractor Superman falls, buried in the soil. Cobb Branden comes to everyone's aid with a shotgun and the distraction buys Clark enough time for a second wind. The S.H.A.D.E vehicle soars in out of nowhere however, smashing Clark into a tree allowing Frankenstein the opportunity to grab Candice and shockingly rip her face off revealing her to be something Lois and Clark never suspected! Story - 5: Is Lois biting off more than she can chew? Following in her husband's footsteps Lois Smith is a mother, a star reporter as Lois Lane at the Daily Planet and now she aims to join the Hamilton Horn. Whatever the case, it opened up the opportunity to scrutinize the population of Hamilton County a bit. I'm surprised Lois didn't stumble upon the truth earlier, not only is Frankenstein and S.H.A.D.E. known to her but he clearly states Candice is a threat, I cottoned on by page five. Still it was cool to see that she thought on her feet in a crisis, brandishing the Hellbat glove and then stealing the hover car. Seeing the writers make Lois a strong and capable woman, that we know she is, makes for a great story. 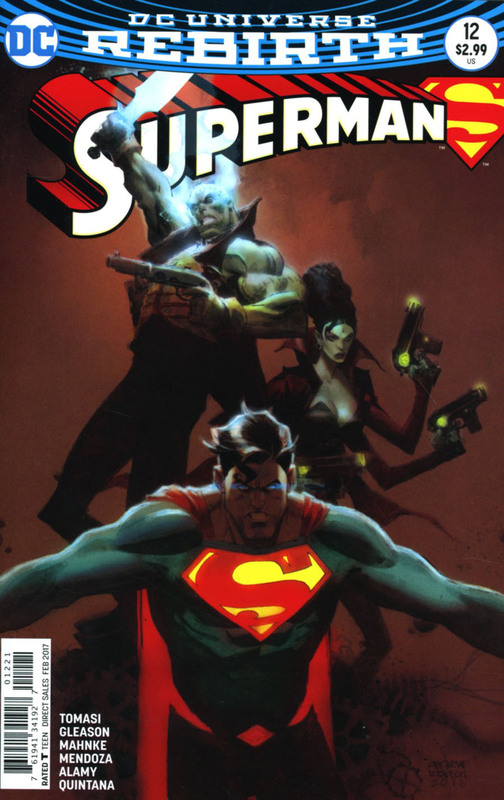 Though Superman features, it is essentially a Lois Lane driven chapter. There was a curious moment when Cobb and Frankenstein came face to face. When Frankenstein confronted Lois he makes it clear she is a human bystander, but both Cobb and Frankenstein refer to one another as creatures while also brandishing a grenade. Is Cobb Branden perhaps more than human or am I over analyzing? Art - 5: I like that each story arc keeps an artist and yadda yadda yadda I've continually praised Mahnke for his fantastic layouts. The inking dips a little here and there but I think that's more to do with the split duties. Superman may have a low character page count this issue but he and Frankenstein definitely steal the limelight art wise. The page with Lois and Candice in the car with Frankenstein clinging to the back is stunning and one that deserves a particular mention. 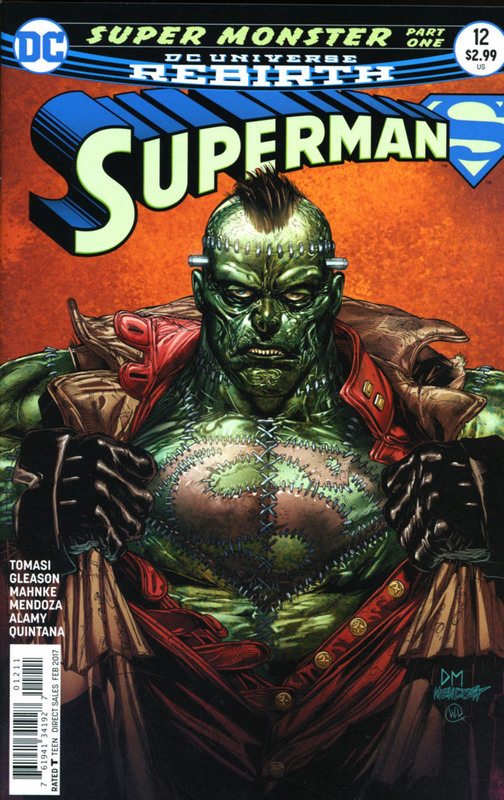 Cover Art - 4: I've never really liked the DC Comics version of Frankenstein but on this cover there is a certain creepiness to him that makes the skin crawl. Couple that with Superman's shield stitched into his flesh, and it makes it far more macabre than when Saviour or Superboy Prime carved the shield into themselves. It's a really strong image and the large inked areas add to the darkness. Variant Cover Art - 4: A cool image of Superman with a strong brightly lit and colored shield. With the large brown areas of 'empty space' it just seems to be a much weaker image with even the titles blocking out some of the artwork. The direct edition cover just seemed to be stronger overall.